According to a post from Shaun King, a civil rights activist, the Union County Sheriff's Office is putting Nike shirts on its inmates for mug shots in protest of the company's deal with Colin Kaepernick. UNION COUNTY, Ark. (KTHV) - "It's all a big misunderstanding," said the Union County sheriff. According to a post from Shaun King, a civil rights activist, the Union County Sheriff’s Office were allegedly putting Nike shirts on its inmates for mug shots in protest of the company's deal with Colin Kaepernick. We went directly to Sheriff Ricky Roberts to Verify if the viral social media claims were true. The post that started it all appeared at 7:37 p.m. Wednesday, Oct. 10 from the King’s Twitter account, In addition to leading protests at Black Lives Matter events, King is a contributing writer for media outlet The Intercept. The post featured between 16 and 20 mugshots of people all wearing the same t-shirts made by Nike. King credited a source for telling him the intent was to mock the shoe company's recent "Just Do It" campaign featuring Colin Kaepernick, the former NFL quarterback who protested police violence against blacks by kneeling during the National Anthem. Sheriff Roberts says King is reading way too much into it. 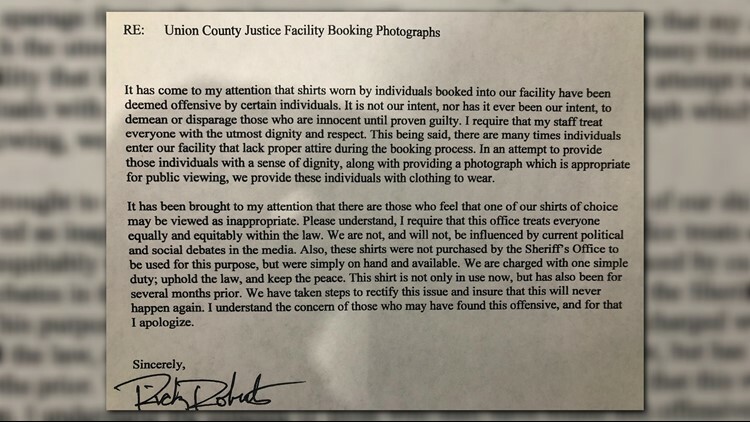 Prior to speaking with THV11, Sheriff Roberts released a statement saying the Nike shirts worn by inmates in the photographs are for those that enter the facility that lack proper attire during the booking process. The sheriff's department said they had the shirts several months prior to the Nike Kaepernick ad release. He says if someone entering the jail had inappropriate or embarrassing clothing, they offered him or her the shirt. Transfers from prison in obvious jail garb also got one. Of 193 inmates, Roberts says 20 had their pictures in one of three Nike shirts they fetched from Lost and Found. He says no one spent any money on the shirt. As the controversy flared, The sheriff's department took down every mug shot on the jail roster. They then offered to retake photos of the 20 inmates wearing the Nike shirts. The sheriff expected all photos restored within a day or two. Sheriff Roberts says he regrets the whole incident. We can verify that he apologized but we can't verify his intent before taking down all 193 mug shots. We can also ask an El Dorado small business owner and mayoral candidate if she believes him. Smith-Creer reached out to the sheriff as soon as she was tagged in the post Wednesday night because she wanted to get the facts straight from him. Roberts wishes the person who posted the photos had done the same thing. Sheriff Roberts also said if Kaepernick ever came to Union County, it would be his agency’s job to make sure he had every opportunity to protest or make any statements within the law. The full statement reads, “It has come to my attention that shirts worn by individuals booked into our facility have been deemed offensive by certain individuals. It is not our intent, nor has it ever been our intent, to demean or disparage those who are innocent until proven guilty. I require that my staff treat everyone with the utmost dignity and respect. This being said, there are many times individuals enter our facility that lack proper attire during the booking process. In an attempt to provide individuals with a sense of dignity, along with providing a photograph which is appropriate for public viewing, we provide these individuals with clothing to wear. It has been brought to my attention that there are those who feel that one of our shirts of choice may be viewed as inappropriate. Please understand, I require that this office treats everyone equally and equitably within the law. We are not, and will not, be influenced by current political and social debates in the media. Also, these shirts were not purchased by the Sheriff’s Office to be used for this purpose but were simply on hand and available. We are charged with one simply duty; uphold the law and keep the peace. This shirt is not only in use now but has also been for several months prior. We have taken steps to rectify this issue and ensure that this will never happen again. I understand the concern of those who may have found this offensive, and for that I apologize.